MirroFlex™ Structures are decorated thermoplastic sheets with high impact resistance and are available in a wide variety of patterns and colors. They can be used as a value-added product in areas that vertical grade High Pressure Laminates (HPL) are typically used. Sizes - 4’ x 8’ x .032” (1220 x 2440 x .8 mm). MirroFlex Structures are also available as 2’ x 2’ and 2’ x 4’ Lay-in (grid) ceilings tiles; 2’ x 2’ and 2’ x 4’ Glue-up tiles; 18” x 24” Backsplash tiles; and 30”- 32” x 48” Wainscot tiles. Most product ships with clear protective film or with TuffCote™. Slight imperfections and color variations from sheet to sheet are possible and considered normal. Please inspect each sheet carefully before fabrication to insure it meets your needs. Like HPL, Structures sheets can be bonded with contact cement, but you must use a product compatible with PVC. MirroFlex™ Structures can easily be cut to size with razor knife and scissors or with routers, saw blades, and drilling tools for thermoplastics. When fabricating MirroFlex always cut from the decorated side. Clean only with warm soapy water. Never use abrasive cleaners. Molding is available to join and finish Structures sheets. Inside corners, outside corners, edge trim and universal trim strips are shown below. Trims available in 4’ or 8’ lengths. GridMax is a patented ceiling grid cover system that fits all 15/16 suspension grid systems. GridMax 4ft Mains, 2&4ft Tees and4ft Wall Covers are available in most MirroFlex Structures finishes. BOXES containing enough GridMax cover to do 100 sq. ft. ceilings are available in most Structures finishes and this is the preferred method of our inventory. If a custom color is desired, choose our standard MirroFlex Paintable (white) or EccoFlex Paintable (beige) finish. Use recommended paints in accordance with manufacturer’s recommendations. Due to the high chemical resistance of it, only certain paints adhere well. It is very important to use recommended paints to paint MirroFlex Structures Paintable and EccoFlex Paintable sheets. * For external applications using Sherwin-Williams Polane Series, use exterior catalyst V66V27. The ratio is 6 parts paint, one part catalyst. Paints Not Recommended: The following types of paints have provided poor adhesion in laboratory testing. Decorative Ceiling Tiles does not recommend the use of the following paint types for MirroFlex Paintable or for EccoFlex Paintable: Epoxy Paints, Water-Based Latex Paints, and Oil-Based Enamels. Even though Decorative Ceiling Tiles as experienced difficulties with the paints listed above, customers may experience success with these paint types in the field. CAUTION: All MirroFlex sheets being applied to surfaces with any recommended adhesive systems must be acclimatized. All components to be joined must be acclimatized for 24 hours prior to installation. Installation between 65° F and 80° F and humidity of 80% or less is necessary. For every 4-foot wide sheet an expansion space of 1/32” (8-foot sheet = 1/16”) is necessary. Failure to comply with the above in addition to adhesive manufacturers’ installation instructions may result in significant installation problems. MirroFlex Pressure Sensitive Adhesive Backing - can be supplied to most products. Usually requires the wall or ceiling to be treated with a contact adhesive to insure proper bond. Some Tin type (Our Old World Collection) “glue-up” designs work well with this type and are ideally suited to backsplash applications. MirroFlex Pressure Sensitive Adhesive Rolls (double sided) - bonds MirroFlex sheets to most surfaces. Each roll contains 40 linear feet x 1½” wide (12.15 meters x 38mm). Contact Adhesives – Brush or roller-on types, non-flammable, and water based contact adhesives, suitable for PVC, work well. Follow the manufacturer’s instructions carefully before installation. Spray-on aerosol types like 3M 77 works well. Cold Press Adhesives – MirroFlex Structure sheets may be laminated in a cold press using Wilson Art adhesive 3301 and Wilson Art adhesive3310. Pressure must be adjusted to the lowest amount that will produce an acceptable bond so that formed pattern will not be damaged. Pressure needed will vary with each structure pattern. Before starting the installation, surface must be dry, smooth and free from dust, grease, wax, and other particles*. Measure the area to be covered to determine how many tiles you will need. Draw a plan to visualize how the edges and corners will work. When drawing your plan, it is best to center MirroFlex panels on the ceiling leaving equal margins on opposite sides of the room. Now transfer the plan to the ceiling snapping chalk lines to help you keep the tiles aligned. MirroFlex ceiling tiles should be installed from left to right, starting at the farthest point away from the room entrance. 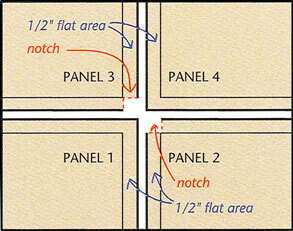 When overlapping 4 MirroFlex panels, it is necessary to cut a ½” notch in panel numbers 2 and 3 to avoid an overlap buildup that causes a “bump” (see sketch 2). Carefully apply the adhesive to the ceiling (or wall for 2’ x 2’ wall applications) and lay up your first tile applying pressure as you hold it. (If installing a tile with protective masking, you can remove it at this step of the installation. Make sure the tile is straight before you continue with the next one. Repeat this process, working left to right (and removing the protective masking after installing each panel, if applicable). When finished, use a paint roller on an extension pole to apply additional pressure to the ceiling. Filler strips can be installed around the perimeter of the room if desired. * The method you choose for cleaning prior to application must be compatible with the surface you are cleaning (e.g. denatured alcohol, degreaser, soap & water, TSP, Greased Lightning, etc.). Check the manufacturer’s label directions for instructions on using the product. Count how many tiles you will need for the installation. For panels that need to be trimmed, use the mineral tile as a template and using your marker and utility knife (razor, scissors, etc.) score the MirroFlex tile to size and then snap the pieces apart. Install the Grid Max covers to the t-bar suspension grid to allow for a seamless look on your ceiling. Be sure to install all the 4 foot Main covers first and then install the 2 foot or 4 foot Tee covers. The Main covers already come with sections notched out where the Tee grid crosses under it. After all the covers are in place, begin to install all the panels into the suspension grid. If making room for a ceiling lamp, be sure to cut out an opening on the tile where the lamp will be attached. Measure the area to be covered horizontally to determine how many tiles and how many adhesive rolls you will need across (if using adhesive strips) and then measure the height of your backsplash to determine if any trimming is necessary. Apply desired method of adhesive, according to manufacturer’s instructions. Starting at the left side of your backsplash, place tiles with some pressure to ensure a strong hold. (Be sure to remove protective masking if your tiles came with one). As you work from left to right you want to make sure that the flat edge is always on the right. Make sure to apply a bit of your selected adhesive over the flat edge and the wall between tiles for extra hold. Carefully apply your second tile making sure to line them up correctly and apply pressure to the tile for a strong bond. Continue this process until you reach the last tile. Depending on the size of your backsplash, you may need to cut the last tile to fit. If so, measure the area and the tile and then use your straight edge and marker to mark the cut line. Using your scissors or utility knife, cut firmly on the decorative side of the tile and snap the pieces apart—note: if your tiles came with protective masking you must cut from the backside. Measure the area to be covered to determine how many panels you will need. MirroFlex wall panels should be installed from left to right, making sure the small flats of the panel are to the top and right (if your panel has Built-in-Overlap or BIO). After applying your selected adhesive to the wall, according to manufacturer’s instructions, lay up your first tile applying pressure as you hold it (if your panel came with protective masking, gently remove it now). Make sure the panel is straight before you continue with the next one. Repeat this process, working left to right (removing the protective masking after installing each panel, if your tile came with masking). When finished, use the paint roller on an extension pole to apply additional pressure to the wall. Some outlet covers (simple, inexpensive) can be covered with matching covers. To do this, peel the backing off of the outlet cover piece and lay flat, placing the sticky side up. Place the outlet cover centered and face down on the adhesive sheet. Using a utility knife, cut a square away from each corner. Fold the edge of the adhesive sheet over the outlet cover to create a seamless finish. Turn the cover over, and use a utility knife to carefully cut away the outlet openings. Decorative Ceiling Tiles, Inc. believes all information contained herein to be correct. It is the responsibility of the fabricator/customer to completely test the adhesives and methods of fabrication to ensure that the results are satisfactory. ATI is not responsible for any fabrication or ancillary costs involved with using MirroFlex products. All shipments are to be inspected within 10 working days after delivery. We are to be informed in writing of any potential adjustment necessary. The seller’s only obligation will be to replace defective sheets on a one to one basis. Neither the manufacturer nor the seller shall be liable for any additional damage or loss, directly or indirectly, arising as a result of using MirroFlex products. Slight imperfections and color variations from sheet to sheet are possible and considered normal. Please inspect each sheet carefully before fabrication to ensure it meets your needs. Visit us online at www.decorativeceilingtiles.net for the latest patterns and finishes. Can I use Styrofoam ceiling tiles in a grid system?